South Africa's Karoo Array Telescope (file photo). We're living in a time when data and knowledge have become key resources for economic development. Developed economies have recognised this and have increasingly embraced knowledge creation as a way to secure their competitive advantage. They've done so by, among other things, investing more in education with an eye on producing more highly skilled graduates who can thrive in an increasingly technology-driven world. 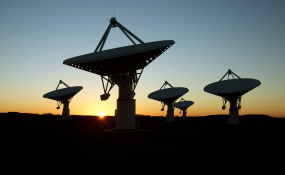 And in South Africa, the Square Kilometre Array (SKA) project is an example of a promising knowledge-based initiative. It could be one of the drivers that contributes to the country's economic growth. The SKA is a global project to build the world's largest radio telescope. It's co-located in South Africa and Australia. When it's completed it will cover over 1 million sq metres and will help scientists seek answers to fundamental questions about the nature and origin of the universe. I found four key factors that determine the extent to which the SKA will be able to contribute to the creation of a robust knowledge economy. These factors are institutions; interrelationships; innovation and individuals. My research suggests that, thanks to these four factors, the project has already borne fruit for South Africa. It has led to good collaboration, sharing of skills and substantial growth of the country's astronomy community. Firstly, a project like this needs to be supported by sound institutions if it's to contribute to the long-term, sustainable growth of a knowledge economy. There must be stable and consistent funding and policies at government level. And a country's broader institutional environment needs to be open and inclusive. This all encourages diverse participation and creative cross-over of ideas. For instance, teachers from the towns closest to the SKA site have received training in robotics through the project. And members of the SKA's management team have shared their skills to help the municipality with its integrated development planning. SKA's South African arm is taking part in numerous collaborations across sectors that promote knowledge sharing and joint problem solving. Its commercialisation strategy is essential for the project to have a great impact on the knowledge economy. It has done substantial work to grow South Africa's astronomy community through a special human capital development programme that's aimed at training young people. More than 1000 young people have benefited from this and similar SKA programmes, and those who've been trained are not limited to careers in astronomy: they contribute to the knowledge economy by using their skills in other sectors. But, even at this early stage, the project is already contributing to the growth of South Africa's knowledge economy. The four pillars I explored in my research provide a framework for better understanding how further growth and gains can be encouraged.